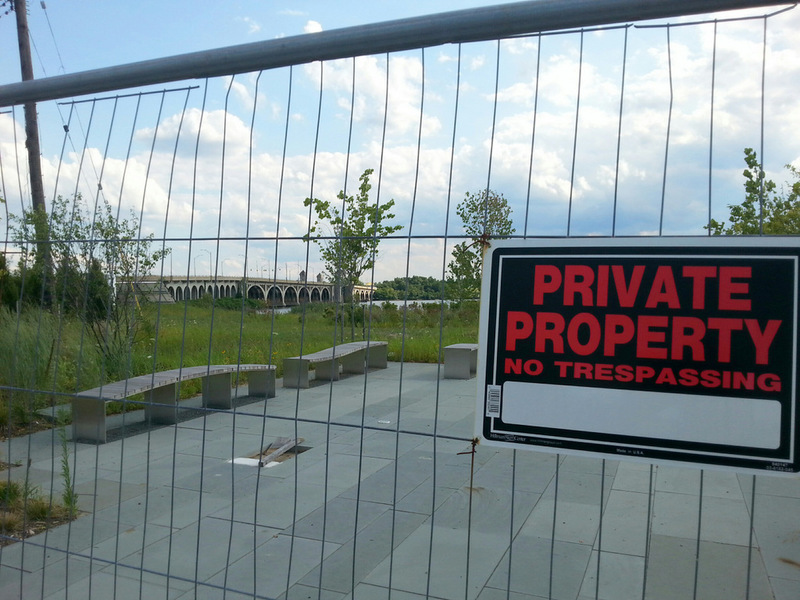 Above: A view inside West Covington Park, which is mostly finished but fenced-off from the public. Over the past several years, the National Aquarium has created a magnificent waterfront park in South Baltimore overlooking the Middle Branch of the Patapsco River. 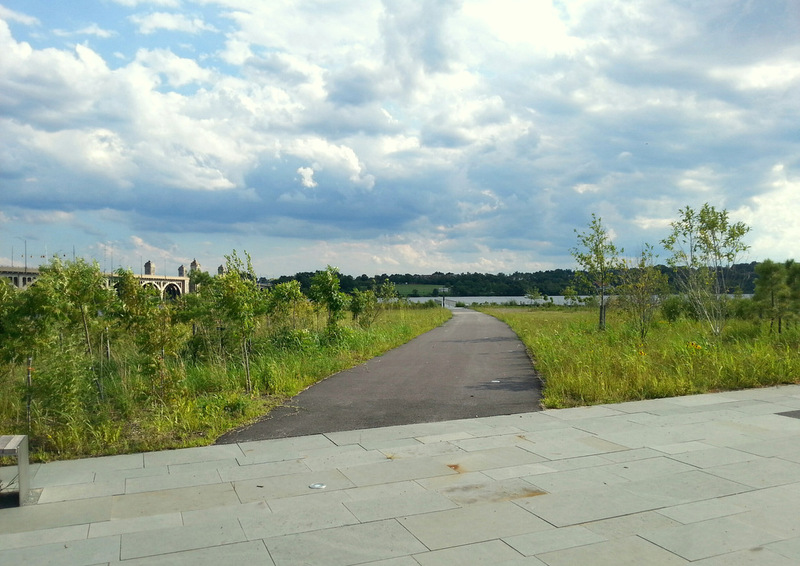 New plants and trees frame trails created to provide easy access to the water’s edge. There are new lights, bike racks and strategically placed benches for picturesque views of the Hanover Street Bridge and the Baltimore Rowing Club headquarters in the distance. Only one ingredient is missing from this waterfront paradise: People. The aquarium initially thought that the West Covington Park would be completed in 2011, according to the web site of its designer, Ayers Saint Gross. More recently, articles on SouthBmore.com forecast an opening last summer and then this summer. Now the aquarium isn’t making any promises at all. Aquarium spokesperson Kate Rowe said that she couldn’t provide a date for when the aquarium might open the park at Cromwell and Hanover streets. Instead, she issued a statement by email that indicated the aquarium is reevaluating its options for its holdings on the Middle Branch and may sell its land there altogether. The logical buyer of the property is Sagamore Development, the real estate arm of Under Armour CEO Kevin Plank. Sagamore is currently converting an adjacent property, a former city garage once owned by the aquarium, into a 140,000-square-foot manufacturing space for Under Armour and others. Under Armour needs additional land when the facility opens by early 2016, and the aquarium has agreed to provide the company access to part of another parcel it owns at 2400 Clarkson Street. In her statement, Rowe said “it has become clear” that the waterfront park and other land owned by the aquarium along the Middle Branch may be of “greater value to the city and state in the hands of a private developer,” but declined to say whether the aquarium is in negotiations with Sagamore or Under Armour. “We can’t speak for other organizations,” she said. She referred questions about any Middle Branch land sale talks to John Maroon, a spokesman for Sagamore. Maroon was asked a series of questions about Sagamore’s interest in the aquarium’s Middle Branch holdings, including West Covington Park. He has not yet provided any answers. Two factors seem to have prompted the aquarium to rethink its presence and role on the Middle Branch. The chief one is the emergence of Kevin Plank’s companies as the new lead property owners in the area, with nearly 20 times more land than the aquarium ever had. In recent months, Sagamore and Under Armour have acquired more than 230 acres in Port Covington, Westport and elsewhere along the Middle Branch to build a new headquarters for Under Armour, which is currently based in Locust Point. 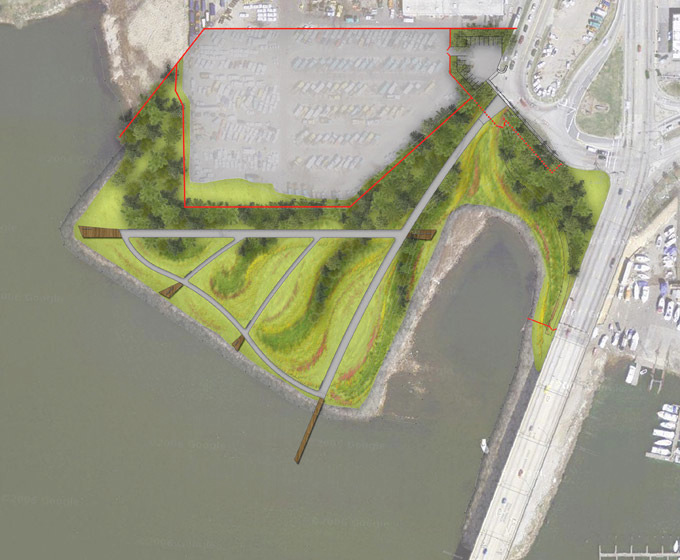 The land includes the former 43-acre waterfront site in Westport assembled by developer Patrick Turner and commercially zoned property in Port Covington. A second and related factor behind the aquarium’s land evaluation is that the aquarium’s main reason for expanding to the Middle Branch – to build a $110 million Center for Aquatic Life and Conservation – cannot be accomplished at this point. The centerpiece of the plan was supposed to be the city’s former vehicle repair garage at 101 West Dickman Street. The aquarium planned to recycle the massive garage to contain an animal care center where its staff could care for specimens not in exhibit at the main aquarium buildings in the Inner Harbor. The project would have replaced a facility that the aquarium leases in Fells Point. The plan was hatched during the Martin O’Malley administration long before Under Armour began buying land in the area. “The Middle Branch is a new frontier for the city,” Andrew B. Frank, executive vice president of the Baltimore Development Corp., told the Board of Estimates in December 2004. City officials were eager to find and support property owners whose presence could spark revitalization activity along the shoreline, considered the “second Inner Harbor” because of its potential for redevelopment. 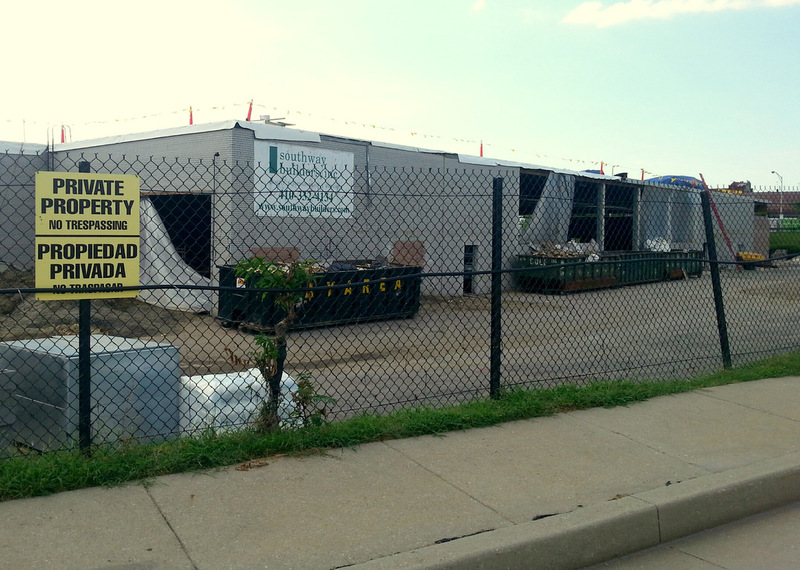 The O’Malley administration decided to build a new vehicle repair shop in East Baltimore, freeing up the Dickman Street property for use by the aquarium. Because the aquarium was a non-profit organization, the city was able to sell the land at a predetermined price without seeking competing proposals. On February 9, 2007, Mayor Sheila Dixon and the City Council sold the Dickman Street Garage property to the Center for Aquatic Life and Conservation (CALC), an affiliate of the National Aquarium. The selling price of $89,000 was far below the property’s market value and far below the cost of building a replacement garage in East Baltimore. On the same date, the city sold two other parcels along the Middle Branch to CALC, also below market value. They were 101 West Cromwell (seven acres, sold for $148,000) and 2300 South Hanover (one acre, sold for $13,000). On August 15, 2007, CALC bought 4.3 acres at 2400 Clarkson Street for $1.5 million, according to state land records. In addition to the animal care center, CALC’s plans called for research facilities, classrooms, office space and a waterfront park with hiking and biking trails, a fishing pier and other amenities. Because the land was zoned for industrial use and had been associated with a vehicle repair shop, the park was considered a brownfield remediation site. The park was to be paid for with a mix of state and federal funds as an environmental demonstration project, providing a model to show how other brownfield sites could be cleaned up for public use. City and aquarium officials predicted that it would be a catalyst for additional redevelopment activity in the area. But less than seven months after CALC purchased the garage from the city, it sold the garage to a private-sector partner who was working on the project. The buyer, Dickman St. Development LLC, was headed by Patrick Turner, developer of the Westport waterfront project. According to state land records, the sale occurred on August 15, 2007 and the price was $1.5 million, closer to the property’s market value. Despite the sale to Turner, the former garage was still a key part of the aquarium’s vision for CALC. The economic recession of 2008 represented a setback for the Middle Branch project. Aquarium officials said the downturn in the economy made it difficult to raise the funds needed to start construction on the animal care facility. The aquarium extended its lease in Fells Point, taking pressure off the need to move to a new location, and continued to focus on the park. 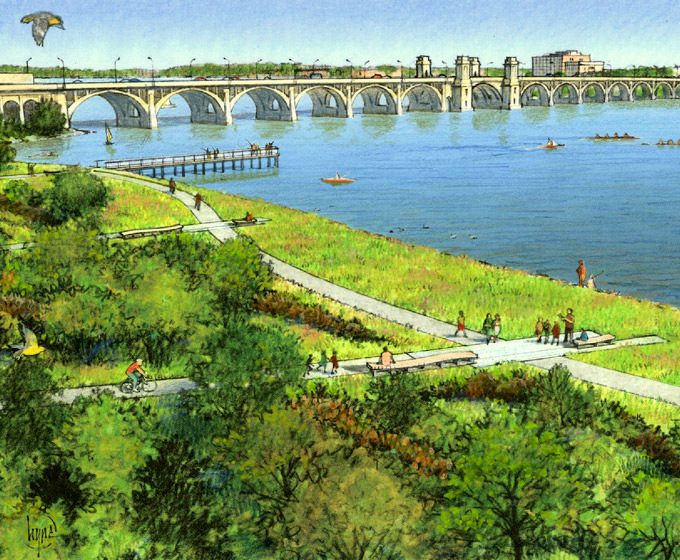 The aquarium unveiled final plans for a “publicly accessible waterfront park” on the Patapsco River in May 2010. 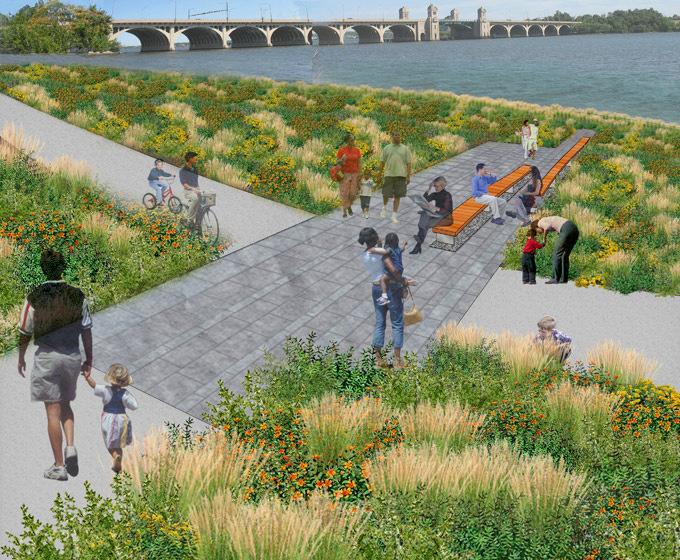 The area was described by Ayers Saint Gross as a “conservation demonstration park” that would feature habitats for migratory birds and native insect populations, a recreational pier and a network of trails. In 2013, with the park under construction, the aquarium’s ability to carry out its vision for CALC was undercut further. Turner, who bought the Dickman Street garage for more than 15 times what the aquarium paid the city for it, had run into financial troubles related to his Westport venture. He ultimately lost his 43-acre tract to a mystery buyer in a foreclosure sale. The buyer turned out to be an affiliate of Plank’s Sagamore Development. Turner lost the aquarium’s Dickman Street property in another foreclosure sale. On December 23, 2013, a group called Dickman Property Investments paid $1.1 million for the former city garage. This group also turned out to be affiliated with Sagamore and Under Armour. The centerpiece of the CALC project – which the O’Malley and Dixon administrations had gone to great lengths to convey to the aquarium – had quietly become part of Sagamore’s portfolio. The Plank group got the property for $400,000 less than Turner paid for it. The plan calls for the structure to be turned into a manufacturing space where various companies can build or make products for sale. One occupant will be Under Armour’s Innovation Team, which designs shoes. There will be a temporary space to bottle Sagamore Spirit rye whiskey, which goes on the market next year. Other potential activities include 3D printing, flag making, metal working, glass blowing and blacksmithing. Construction began with the removal of the building’s outer walls. The building is expected to be ready for occupancy by late 2015 or early 2016, making it one of Sagamore’s first completed projects on the Middle Branch. Although the Dickman project is a logical fit with Sagamore’s other holdings and will lead to new jobs for Baltimore, it will not help the aquarium realize the vision it had for the Middle Branch. In fact, in many ways it could make it harder for the aquarium to do what it envisioned because without the converted garage building as a base of operations, the aquarium will have a more difficult time maintaining and monitoring the surrounding property. The aquarium still owns three parcels it bought in 2007 – 2400 Clarkson, 101 West Cromwell and 2300 South Hanover. Those are the parcels whose fate is now under deliberation by aquarium officials. In some cases, land use is restricted not only by the state’s environmental “critical areas” guidelines, but by the disposition agreements drafted by the O’Malley and Dixon administrations and the city’s master plan for the Middle Branch. The recent completion of the park and emergence of Sagamore as a developer in the immediate area provide an appropriate time for the aquarium to take stock of its holdings in the Middle Branch. • Is the rest of the aquarium’s land better off going to a long-term user such as Sagamore? • Would Sagamore be a better steward because of its other holdings in the area and its focus on creating jobs? • Would Sagamore, if it purchased West Covington Park, provide public access along the water’s edge, as the aquarium promised to do? Even with the waterfront park unopened, spokesman Rowe indicated that the aquarium is proud of the impact it has had on the Middle Branch. “When we acquired the site, we committed to remediate the brownfield and landscape the area with plantings that [create] a public asset for the city,” she noted in an email message.